Electric chainsaws produce very little noise and are therefore perfect for use indoors, in residential areas or wherever noise may be an issue. STIHL has ensured that every electric chainsaw they produce is ergonomically designed and offers incredible comfort throughout every use. 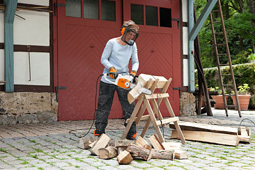 Whether you are looking for a chainsaw as a craftsmen, farmer or homeowner, the STIHL range will have a model that is exactly what you need.